With these two tools, children and adults can make illustrated stories together across time and space, sharing images, sounds and words in different languages and dialects. The ‘shell’ adapts seamlessly to contain locally created content from many regions and cultures – bridging gaps and encouraging creative collaborations between family, friends, Global Classroom ‘pen pals’ and audiences internationally. Reaching out towards . . .
children of 6+ worldwide who want to communicate in their own languages whilst learning new languages, and who seek to create and play together using art, image, sound, music – to share their own visions and voices of the world. The toolkit enables connected learning and community building via storyboarding, text-audio-video interaction, and synchronous chat. The toolkit operates on both Mac and PC. To avoid public chat rooms and ensure ‘safe’ and private communication, enter the Education Folder, SMARTspaces, SMARTroom. The password for entry is available upon request and proof of ID from the SMARTlab. Collaborative on-site experimentation with words, pictures and sound. ViewHear, one of the four component software packages of the SMARTshell, was created by Dr Lizbeth Goodman with Huw Williams of Broadcast Solutions, with input in early phases of development from Tony Coe. The simplest form of the programme functions as a multimedia storyboarding tool allowing users with little or no knowledge of computers or video editing to ‘make movies’ and ‘tell stories’ together across time and space, putting text, image and sound together in their own personalised way. ViewHear was recently launched in a trial with school students at the Media Arts College of Stoke Newington School, London N16. College students in Year 11 were introduced to the ViewHear software package with very encouraging results. As a starting point they used an existing short film archive, published in ViewHear, of ‘Di’s Midsummer Night Party’ filmed by professional camera operators featuring celebrities raving and partying at a local abandoned eighteenth century house. 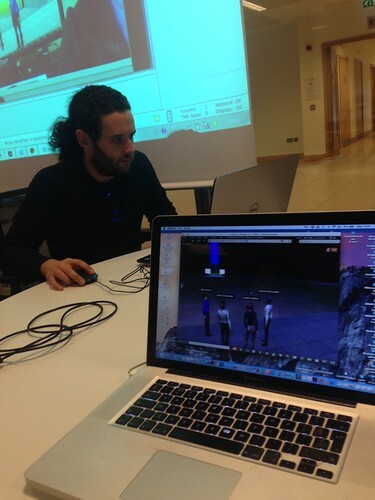 The students at Stoke Newington School became celebrities at ‘Di’s Party’ using ViewHear. New material was filmed on digital video of the students dancing, being celebrities, paparrazzi and security guards and this was imported into the existing story board with new text and sound. ViewHear proved itself once again to be user-friendly and an important tool in developing the students’ critical awareness of the role that words, pictures and sounds have in creating meaning.